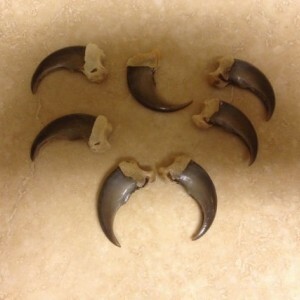 Listing is for ONE claw only $39.99 per claw The bear claw will measure between 2"-2.5" measured professionally around the curve of the claw You will get a claw SIMILAR to the one shown, to be honest I sell these so quickly I can't take photos fast enough. It will be cleaned, and sealed in a protective finish and a #1 quality piece. You will be happy with your purchase! NO INTERNATIONAL SHIPPING ᎣᏏᏲ, (O'siyo hello) ᏲᎾ (Yo-nah) is how to say Bear in my ᏣᎳᎩ langauage. Buyer must check their local laws before purchasing product by purchasing this product I am assuming you have read my store policy and agree to its terms. I am licensed in Idaho if you are unsure if this product is legal in your state please call YOUR local wildlife office/DNR/Fish and game Thank you for understanding. I am not a legal resource for your state wildlife laws unless you live in Idaho. 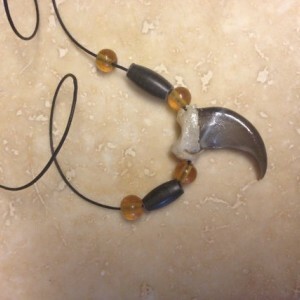 This claw is Cross-drilled and ready to be used as a pendant. It will lay flat across your chest and will not poke you. 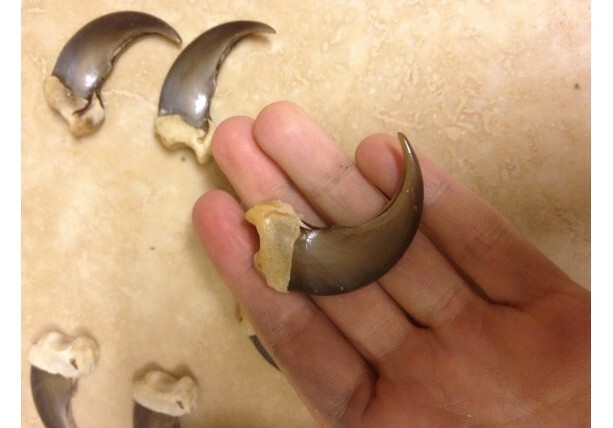 This is a traditional way to wear a bear claw. 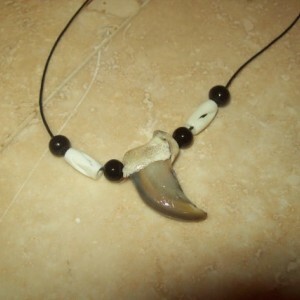 This item is perfect for those of us who want to make our own necklace or tie it to another item for decoration. All my claws come clean polished and sealed in a protective professional finish. Finger nail polish looks nice at first but will peel off making your claws look like they too are pealing. 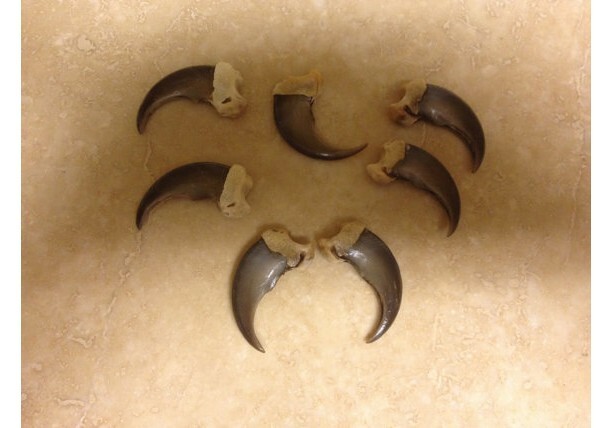 I seal these claws to help them last a lifetime otherwise a claw can break or come off of the knuckle bone. My claws will not do that to you. This is a number one quality finished product. No INTERNATIONAL SHIPPING this is a real animal product and can not be exported without high fees and permits I do not ship internationally. Buyer must check their local laws before purchasing product by purchasing this product I am assuming you have read my store policy and agree to its terms. THIS BEAR WAS NOT HUNTED FOR PLEASURE. My people have harvested bears for thousands of years for spiritual use. There are special prayers made to ask the bear nation forgiveness before taking the life of one of the bear people. Bear meat is high in fat and is quite tasty it is divided amongst the people for meals. To my people bear fat has healing abilities, the fat is rendered secret herbs are added and it is used as a healing treatment and given to many elders. Bear skulls are often used for prayer sticks or alters, bear robes for healing ceremonies to help bring the bear back to the ceremony, we wear bear claws to carry the healing medicine and strength of the bear with us to honor him. 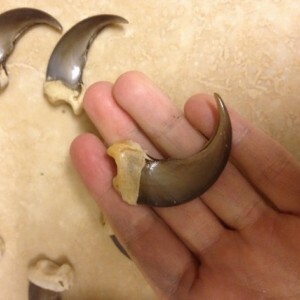 This is a Front black bear claw. Bear stands for inner knowing and is greatly respected in native culture. Bear is the only other animal in the woods that walks on two legs and so therefore most tribes considered him once human. Bear is sacred, he finds the answer to all life's questions through his dreams and knows all answers can be found from within. Bears are introspection and often find themselves alone seeking wisdom on the path of solitude. People with bear medicines often find themselves labels and introvert. To wear this medicine in the symbol of protection as there is no animal that shows greater ferocity when protecting their young as a mother bear.